Halloween is one of my favorite times of the years. Not because I have a party to go to where I can dress up as something fun or weird or scary. It’s not because I do any decorating for the kids when they come up to the door trick or treating…it’s the pumpkin seeds. That’s right! 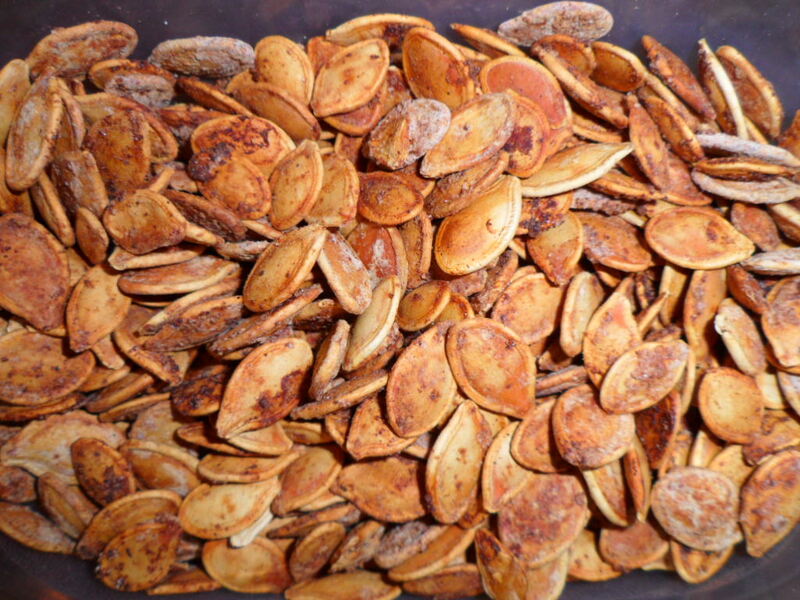 I love eating pumpkin seeds. I tend to go for the more salty foods than sweet foods. Not sure what that means about me. This year we were given a zip lock bag of seeds from my mom’s boss and then my mom bought two medium size pumpkins. This past weekend I had planned on baking these seeds. Every year I end up asking my mom how to do it, and it’s not even that hard, but because I only do it once a year, the recipe never sticks…so I thought I jot it down here and share it with everyone else. So the first obvious step is to cut open your pumpkins and remove all the seeds. Place all the seeds in a big bowl with water. Try to keep the actual strings and pumpkin guts out of the seed bowl. But you can always go back through and pick out those guts a little later. Add salt to the seed bowl and mix it up well. I add enough salt to ensure good water coverage. Let the bowl sit for at least 24 hours. I put mine in the fridge. When ready, drain the water from the bowl and place all the seeds on a cookie sheet (not the flat, no edge type). Turn the oven on Bake at 250-300 degrees. I originally started at 250 but then I ended up raising it to 275, then 300 towards the end to help speed up the process. I think you could probably start it at 300 but you’ll have to watch it more because it will probably take less time. Melt some butter in a bowl. You’ll have to use best judgement on how much depending on how many seeds you have, but ideally you want to give each seed a nice thin coat of the butter. Healthy huh? I know. Pour the melted butter in the cookie pan and spread the seeds around so they all get covered. Make sure you get all the seeds that like to stay around the edges so they get buttered up as well. Take the seasoned salt or season all salt and sprinkle that all over the seeds. Use as much or as little as you’d like. You may end up putting on more over the course of them baking, and that’s okay. Place in the oven and wait. Check on them periodically and stir them so they don’t stick to the cookie sheet and burn. When I started at 250 degrees, the time went past 2 hours, but when I increased it to 275 and then 300 it definitely baked them faster. So my estimates if you start at 300, they will probably take 1-2 hours to bake. This is what is should look like…give or take!